Tree Hotel in Sweden selected by Original Glamping, offers a unique hotel experience: treerooms with contemporary design in the middle of unspoiled nature. Here you can forget about the time constraints of everyday life, enjoy the serenity, and rejuvenate in a sophisticated yet familiar environment. 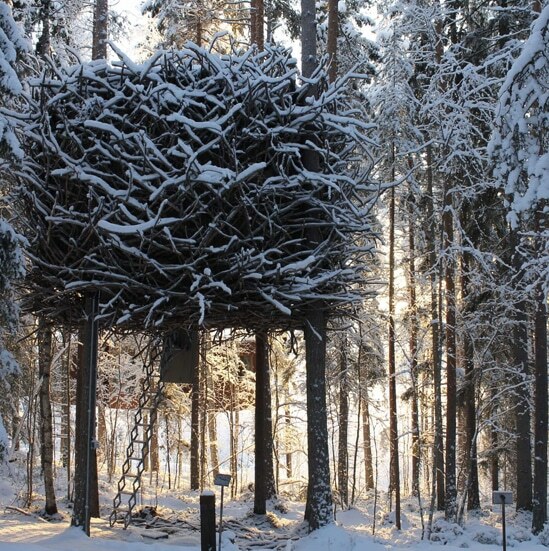 Tree Hotel is located in Harads, near the Lule river, about 100 kilometers from Luleå airport. The village has a population of about 600 and features a restaurant, shop and guest house. When you arrive at Tree Hotel, you check in at Britta’s Pensionat. Then it’s just a short stroll through the beautiful nature to your treeroom.